We already discussed Nochebuena, the real party on Christmas Eve in Latin American countries. In Spain, it takes place about a week later with Reyes Magos. On the evening of January 5th families attend the Cabalgata de los Reyes Magos, a parade for the Three Kings (or Magi) who ride horses or floats and throw candies to the children. It also reflects what we in the United States know as Christmas. There are nativity scenes, decorative lights and festive music. In Spain, it's not Santa that brings the gifts. Rather, Children leave out their shoes for the Three Kings to see, as well as sweets, and leave hay for their camels. In the morning, the hay and cookies will have been consumed and there will be presents by the shoes. The celebration then continues into the next day. This is another opportunity to wow your subscribers with some targeted email marketing. Earn some bonus good faith points with your list members in Spain. 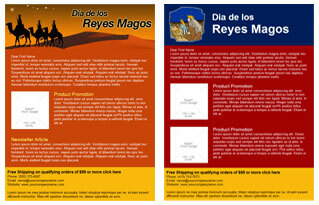 Use a Benchmark Reyes Magos email template and welcome the Three Kings along with your subscribers. And check out more holiday email templates by following the link!